Although the Crickit HAT for Raspberry Pi is not octagonal like other Crickets, the HAT still has the same features that are listed below, just rearranged to fit the rectangular HAT shape. Your project start here, where power comes into the Crickit and is then used to control various motors and parts. We cover the various ways you can power your Crickit in the next section, since there's a lot of flexibility depending on the budget, portability and complexity of your project. Use 5V DC (4V to 5.5VDC range works) with positive-center voltage. If you try to plug in a negative-center power supply, the polarity-protection will kick in and you will not see any lights on the Crickit. 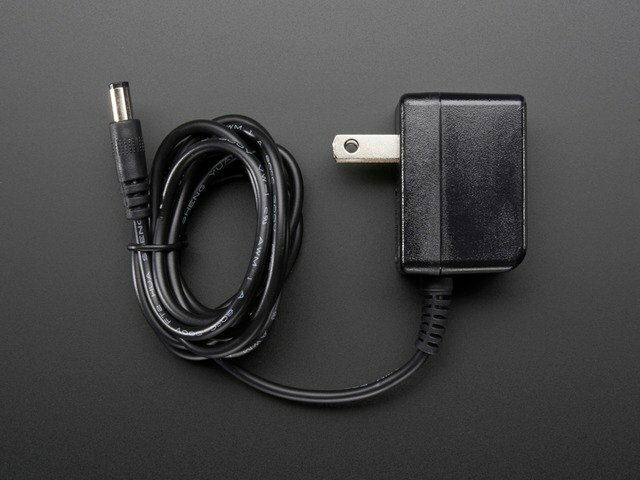 The Crickit uses a power management chip to keep you from accidentally powering it from 9V or 12V, damaging your electronics. Look for the OK and /!\ warning LEDs. If you see the green OK LED, the power is fine! If you see the red warning LED, the voltage is too low, too high, or too much current is being used. You can turn off the Crickit at any time with the On/Off switch. This will turn off the 5V power, completely disabling all motors, as well as turning off the seesaw control chip. There's also a Reset button. This button will reset the seesaw chip, and can be used to load new seesaw firmware (you won't likely have to do that). On the Feather Crickit, this button also connects to the Feather reset pin. On the Circuit Playground Crickit, it does not connect to the Playground Reset button. On the Feather Crickit only, if you double-click the Feather reset button to load new firmware, such as a new version of CircuitPython, the Crickit will also go into double-click firmware-update mode. After you load the new firmware on the Feather, wait for the firmware to start up, and then click the reset button again, once, to get the Crickit back into regular operation mode. And more options in the https://www.adafruit.com/categories! 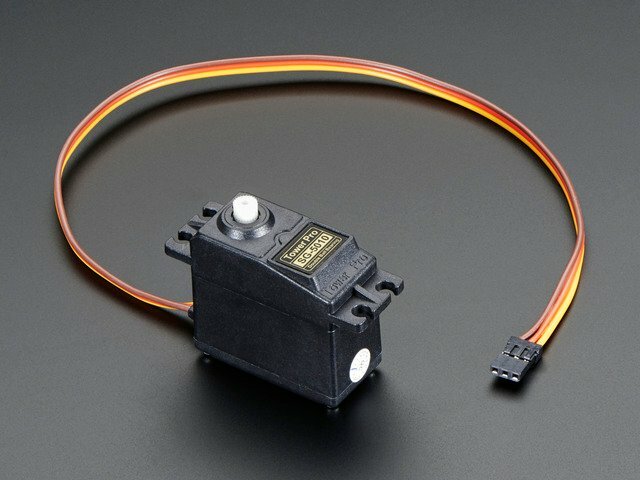 Hobby servos are really popular in robotics because they're fairly low cost, very easy to use, and reliable. The Crickit gives you 4 slots for 4 independent servos. 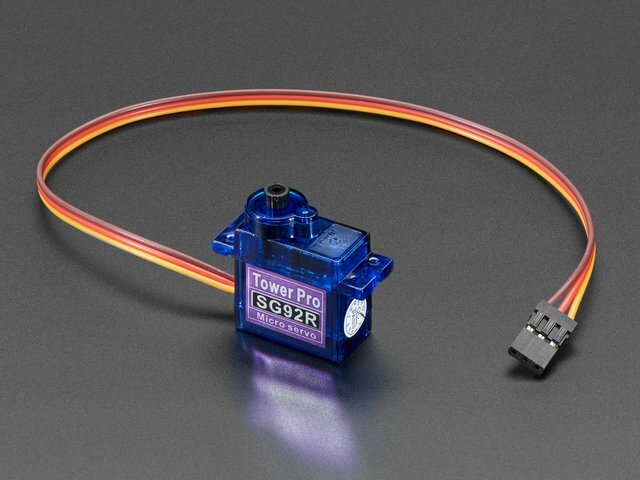 You can use micro, mini, standard, large size servos. Analog and digital work great. Continuous or 180-degree are OK. As long as you've got a servo with a 3-pin connector, you're golden. The white/yellow 'signal' wire goes next to the # marking on each port. The power to each servo comes from the DC power supply, 5VDC nominal. The Crickit can set the pulse width to any value, but in general you'll want to stick to 500ms to 2500ms wide pulses. This is customized in the Arduino, CircuitPython or MakeCode software. There is variation from servo to servo, so getting the exact same speed or angle may require some calibration and tweaking. Again, this can be customized in the driver code, the Crickit just generates whatever pulses you like! The seesaw chip on the Crickit does all the management of these pins so your Feather or CPX does not directly control them, it must send a message to Crickit. They are on seesaw pins 17, 16, 15, 14 in that order. Round & round, DC motors are great whenever you need something to spin. They tend to be faster, stronger and less expensive than continuous-rotation servos, but you need a proper DC motor driver to use them. Luckily, the Crickit can drive two DC motors. You won't be able to control 1.5V DC motors, they'll burn out. You might be able to control 6-9VDC motors, but they'll be a little slow. Same with 12VDC motors. Likewise, you cannot use the Crickit with brush-less (ESC) motors. Those require a more advanced motor driver! Each motor has two wires, you can connect the wires either way. If the spin of the motor is opposite what you want, swap the wires. Instead of 2 DC motors, you could also control a single bi-polar stepper motor (5VDC power) or single uni-polar stepper motor. You'll use the ground pin for the 5th (and 6th, if it exists) wire of the uni-polar stepper. 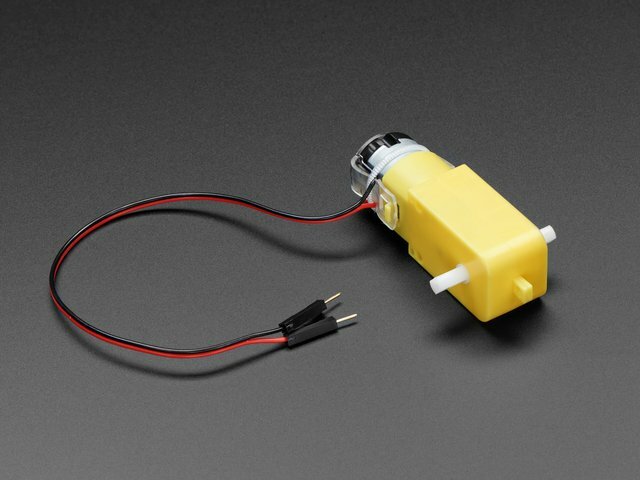 DC Gearbox Motor - "TT Motor"
And more including accessories in the Adafruit Shop! In addition to servos and DC motors, you may find you want to drive other high-power electronics like relays, solenoids, powerful LEDs, vibration motors, etc. Some of these devices are motor-like and need a kick-back protection diode, so having a proper driver is important to avoid damage! This is where you will want to use the high power Drive terminal block. You get four high current drivers. Each driver is a 'Darlington' transistor that, when turned on, connects the output pin to ground. That's a little different than most other outputs on the Crickit: The Crickit can only connect/disconnect the drive pins to Ground! You cannot 'set' the Drive output to be a high voltage. So, if you're driving a solenoid, relay, vibration motor, etc. connect one side to the 5V pin, and the other side to one of the driver pins. You can connect multiple wires to the 5V pin if necessary. 500mA current limit per output, you can double/triple/quadruple pins up to get more current, if you like. Just make sure to tell the Crickit to turn on/off all four pins in a row. Kick-back protection diodes for each output to 5V power. Instead of 4 solenoids/relays you can connect & control a single uni-polar stepper motor, connect the 5th (and 6th if it exists) wire to 5V. Won't work with bi-polar steppers, use the DC motor ports for that. The drive outputs are also PWM-able, so you can control LED brightness or motor power. If using with solenoids or relays, set the duty cycle to 0% or 100% only. The seesaw chip on the Crickit does all the management of these pins so your Feather or CPX does not directly control them, it must send a message to Crickit. They are on seesaw pins 13, 12, 43, 42 in that order. Sure you can drive servos and motors but sometimes you just want to blink an LED or read a button. The Crickit has an eight-signal port. You can use these as "general purpose" input/output pins. We solder a 3x8 female socket header in so you can plug wires in very easily. Each signal has matching 3V and Ground power pins. Bonus: If you absolutely need more capacitive touch pins, Signal #1, #2, #3, #4 are four more capacitive touch inputs. Signal pin #1 is special and can be set to be a true analog 'output' with 10-bit precision. 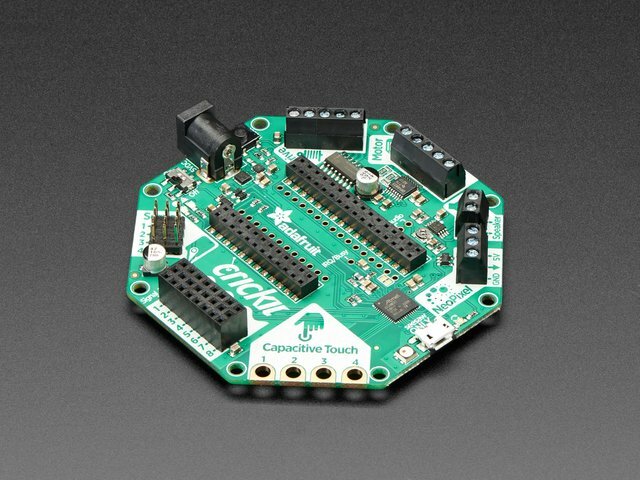 Capacitive touch sensing allows you to add human-triggered control to your robot. When you touch the pad (either directly or through an alligator clip, copper tape or conductive ink) the Crickit can detect that signal. We give you four capacitive touch inputs with alligator/croc clip compatible PCB pads. But you can have the metal also connect to salty-wet items such as fruit or water. However, do not try to dunk the Crickit into water or squish a grape into the pads - use an alligator clip! Bonus: if you absolutely need more signal I/O pins, all four capacitive touch pads can also act as analog/digital signal I/O pins! The seesaw chip on the Crickit does all the management of these pins so your Feather, micro:bit or CPX does not directly control them, it must send a message to Crickit. They are on seesaw pins 4, 5, 6, 7 in order. Blinky lights will make your robot fun and fashionable. And we've made it really easy to add NeoPixels (WS2812/WS2811/SK6812 chipsets) to your project. 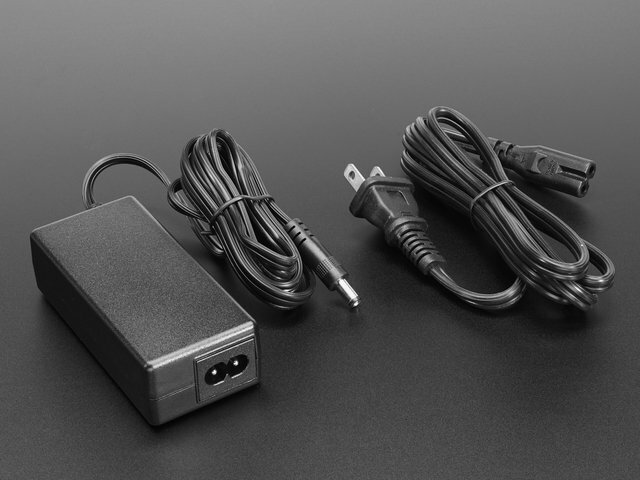 The Crickit has a 3-terminal block connector with Ground, Signal and 5V power. The signal line has a level shifter on it so it will be 5V logic level, for nice clean signals. If you have a Feather Crickit then the NeoPixels are driven by the seesaw chip on the Crickit, and you must send seesaw commands to set colors. But that means no extra pins are needed from your Feather. 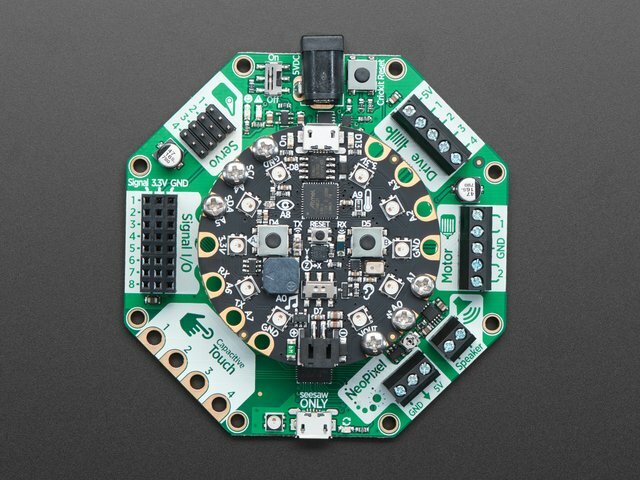 If you have a micro:bit Crickit, NeoPixels are driven by Pin 16. You can use the NeoPixel Extension in MakeCode, specify Pin 16 as the pin the NeoPixels are connected to and you're set. However, if you want, you can cut the jumper underneath the Crickit and solder closed the ss pad so that the seesaw chip controls the NeoPixels (for advanced hackers only). Adafruit sells a very wide variety of NeoPixel products - shop here in the Adafruit Store! Audio animatronics? Yes! Your Crickit can make fairly loud sounds thanks to the built in Class-D speaker driver. This will let you amplify audio. However please note that the Crickit does not in-itself make audio. The audio must come from the controlling board, such as the Feather or Circuit Playground. 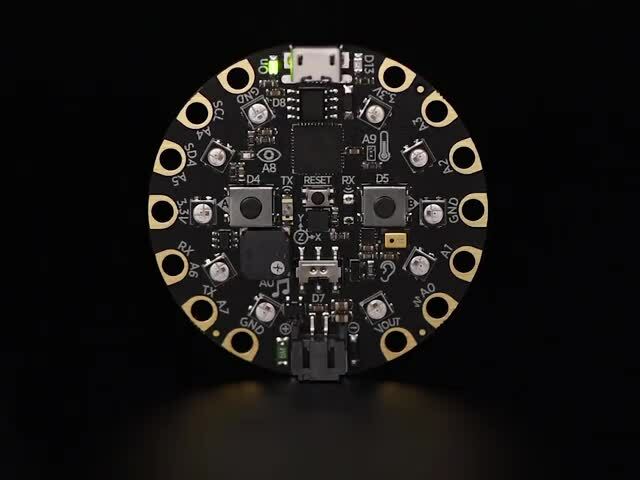 At this time, we recommend using the speaker with CircuitPython. MakeCode and Arduino can make tones but don't have easy to use features such as WAV file support. There's a small potentiometer you can use to adjust the audio volume. By default we set it to the halfway point. Please be gentle if adjusting, don't try to crank it past the two stop-points. Ouput is 5VDC BTL (bridge-tied-load) so do not connect to a stereo system or other line-input! On the Circuit Playground Crickit the speaker is connected directly to the A0 pad (the analog output). On the Feather Crickit the speaker input is marked Audio on the PCB and you can solder a jumper to the Feather A0 pin if desired. On the micro:bit Crickit, the speaker is connected to Pin 0, the standard micro:bit audio output pin. And more in the Adafruit shop! If you have a Circuit Playground Crickit, you can attach the Playground in the middle using 6 standoff bolts that come with the kit. Make sure you tighten these as loose bolts can cause connection issues. If you have a Feather, you can plug it right into the center of the Crickit. There's an optional AUDIO jumper if you want to connect the A0 Feather line to the Speaker. The micro:bit Crickit is the easiest of them all! Just plug in your micro:bit with the LED grid facing towards the pin numbers as shown on the Crickit silkscreen. You'll also see that Pin 0 is marked for speaker use and Pin 16 for NeoPixels (sun icon). The Crickit HAT for Raspberry Pi uses the standard Pi 40 pin header (at top in the picture at left) to plug onto the Pi expansion header. The holes in the Crickit HAT align with the holes in the Pi so you can use standoff posts for a secure fit. All of the functional blocks on the octagonal Crickit boards are on the Crickit HAT, they are just moved to fit the rectangular HAT shape. Across from the power input is the seesaw debug USB connection. This USB power cannot power the Crickit and it also does not connect to the Feather or Circuit Playground USB. It's only for debugging/reloading seesaw firmware. Basically, if we add more Crickit capabilities, you could load new firmware over this USB connection. In general, you won't be using this port, you may want to cover it with some masking tape! This guide was first published on May 16, 2018. It was last updated on 2019-04-11 10:08:00 -0400. This page (Crickit Tour) was last updated on Apr 20, 2019.